Websters dictionary defines discipline in part as “training that corrects, molds, or perfects the mental faculties or moral character.” It can be seen as the rejection of instant gratification, even though it may seem harmless enough, in favor of something that aspires to a higher and better goal. It can be hard work, unglamorous and it often goes unnoticed. This helps to explain why discipline is not the most popular of characteristics these days… as a culture, we’ve accustomed ourselves to having whatever we want, whenever we want it, and without any sense of consequence or downstream effects that our actions may have. Exacerbating this notion of entitlement is an endless stream of temptations and distractions that flow in front of us each and every day. As an example, estimates claim that an American can see up to 5,000 advertisements each and every day… the tenacity of this media influence is astounding. So I’ve come to determine that both this sensory bombardment of media and our current level of entitlement go hand in hand. When combined, they can come to represent the incredible force and influence our predominant consumer culture has in shaping our lifestyles and values. It wouldn’t be a stretch to equate this force to that of a river with a strong and persistent current, carrying with it virtually everything it touches (think of its influence on economic theory, labor, politics, social norms, etc). And this analogy can be taken even further, as ‘going with the flow’ of this status quo river can not be seen as meandering peacefully like the mighty Mississippi, but is in fact pulling us into a nasty stretch of Class 5 rapids. We’re now getting swept into unprecedented issues like climate change, global water shortages, economic instability, continent-sized garbage patches in the oceans, extreme inequality and poverty for billions of people. Some awful stuff indeed, but the thing is, none of these issues are the concoctions of a few madmen hell-bent on destroying the planet, but are in fact externalities of billions of decisions made on a daily basis by all of us over long periods of time. These seemingly harmless decisions can ultimately be seen as a lack of ‘training or perfecting our moral character’ and are therefor deficiencies of, you guessed it, discipline. Well, these experiences have taught me a lot, really more than any piece of literature I have ever read has. I was able to analyze my relationship with the things I had come to associate as detrimental to not only myself and my community, but also the planet at large. These personal challenges instilled a sense of accomplishment and pride in me that I was able to withstand the barrage of temptations… they made me stronger, wiser, more confident, and healthier. And they gave me invaluable information… I learned that a meat-free diet is incredibly easy to achieve and that a plastic-free lifestyle is tremendously difficult (next time you walk through a grocery store, look at all the packaging!). Best of all, several of these lifestyle experiments have since been locked into habits. I am now eating a 99% meat-free diet, I don’t own a car, I still pick up litter wherever I go, have a steady yoga practice, barely purchase anything new, and am growing more and more of my own food. I’m happier, healthier, and have brought my environmental footprint dramatically down… yah woo! If an individual firmly establishes intentions of being a better environmental steward (for example), they develop keener awareness or sensitivities to issues that were previously invisible or disregarded. This sensitivity or awareness manifests itself into individual actions (like my personal challenges above) which not only have the potential to transform themselves into habits, but can act as as signals to those who are connected within one’s social network (think close friends, families, etc) to confront a specific issue themselves. It takes time, but this essentially is how cultures are formed, when enough people shift individual actions into collective actions. 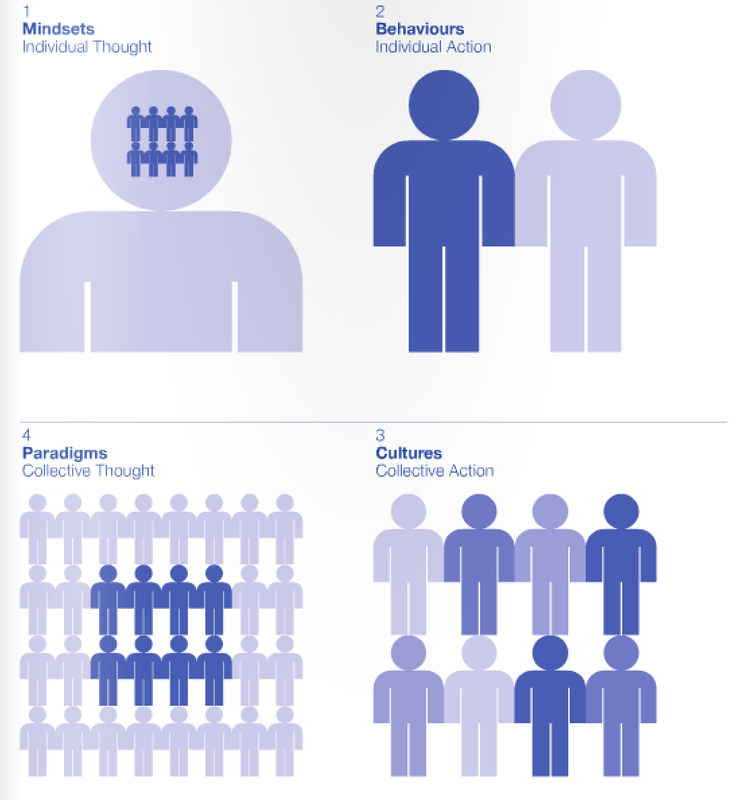 The visual below concisely shows how a mindset (or an individual thought) can be shown to be upstream of a broader paradigm shift (collective thought). Building upon this, scientists have discovered that what happens in the brain when an individual repeats something over and over is that a pathway called a neural circuit is formed, and it gets stronger every time we think or do the same thing. Like a river cutting through a valley, the longer it flows in the same path, the deeper and stronger that path becomes. This is how habits are formed, and it’s been determined that it generally takes the brain about three weeks to create strong new neural circuits – a new path for the river to make. Since our thoughts and actions naturally move along a path of least resistance, discipline plays a vital role in providing and maintaining this resistance, forcing us to be aware of the various temptations and subconscious tendencies that arise before a new neural circuit is formed. If you’re further interested in the neuroscience behind this process as well as HOW to create new neural circuits, I highly encourage you to read this article here, The Science of Change. Self-discipline is really at the center of personal greatness. Rejecting unnecessary, harmful or distracting desires builds one’s inner strength, much like going to the gym to exercise muscles develops physical strength. The manifestation of this is increased confidence and self-awareness, tools that are imperative for an optimized life. When this discipline is paired with an authentic commitment to both personal and collective growth, constructive and beneficial change is all but inevitable. Furthermore, self-discipline is a professional tactic that can help an individual differentiate themselves from others. The most innovative and effective people in any industry have a common trait of controlling their information flows and management of time… basically, they’ve taught themselves how to get more done with less, something we all aspire to do. Another particularly tough one to swallow was when a peer of mine who’s an international leading expert on ‘ethical building’ posted a photo online of a plate of swordfish that he was preparing to eat… yes, it’s on the red list, yes he knew it, and no he didn’t really care… in fact, he was quite spiteful that I called him out on it… his authenticity points on talking about anything ethics-related sank like a rock. These are of course harsh analyses of well-intended people who are doing what they can with what they know… we can’t all be perfect. It’s important that we do our best to offer constructive support to ensure confrontation and feelings of regret and guilt can be minimized. But to be honest, I feel this significant disconnect between what many of us say and what we actually do needs to be called out more frequently… we need to bridge this gap, quickly, and ruffling a few feathers along the way is al but inevitable. And this issue of authenticity is particularly important because if left unchecked, a message is broadcasted to the world that it’s acceptable to be a strong spokesperson for change while having a lifestyle that looks exactly like everyone else’s… this can be confusing and misleading. Just look at the Al Gore discourse from a few years back, when many climate change skeptics discredited his entire message simply because he himself lived in a huge energy guzzling house and flew around in private jets… they felt that he was a hypocrite and not in a position of authenticity to earn any trust or respect. And they were partially right (not about the science, but about not trusting him). So the point is, authenticity is paramount. If we’re wanting other people to change their behaviours, we first have to change our own or risk losing credibility in the messages we represent. We’ve become very good at criticizing others and the institutions around us, but often fail to hold that same level of accountability for ourselves. It’s also worth identifying how inextricably linked our personal health is with global health. A couple examples to play with… the average American is now consuming about 160 pounds of refined sugar a year, when our bodies are genetically accustomed to handling about 10 lbs/year. Similarly, the amount of processed meat we are consuming is at record highs (Americans now eat twice as much meat per person as was consumed in 1940). Scientists have now clearly linked both refined sugar and red meat directly to diseases like diabetes, heart diseases and certain types of cancer. These diseases are ultimately the culmination of thousands of somewhat menial decisions of what people choose to put into their bodies. Similarly, climate change is the culmination of a significant number of somewhat menial decisions of how we collectively choose to transport ourselves, feed ourselves and draw our energy. When diagnosed with cancer, or when looking at an added foot of water to the oceans, it is easy to look back with 20/20 hindsight and see the poor decisions that were made over an extended period of time… It takes discipline to not only understand the cause and effect of complex systems, but to act on behalf of the information that is uncovered. 5. Without discipline, we’re kaput! Really, what it comes down to is that if those of us who understand the challenges ahead are not disciplined enough to act on our beliefs, we’re all kaput. We are well past the point of believing that other people, institutions or political bodies are capable of solving the complex challenges that we face. It will take a groundswell of awareness on a societal level to imagine, design and construct a future that works for all. This will require an incredible amount of discipline to step away from the status quo and resist the constant onslaught of messages shoved in our faces by those with vested interests in maintaining things as they have been. It takes discipline to swim upstream, to forge new paths, to run a different direction from the herd, and to take on the fatalistic message that our primary value in society is to be a ‘good consumer’. It takes discipline to say no to hopping on a plane to fly somewhere for a well-deserved holiday, to resist the temptations of ‘retail therapy’, or to buy the salad instead of the cheeseburger (honestly, I don’t know any vegetarians who decided not to eat meat because they disliked the taste of a cheeseburger!). And lastly, it takes discipline to stand strong in our convictions within a social environment that is undeniably threatened by change. Discipline is really at the center of all transformational change. And coming back to the river analogy real quick… if it’s clear that the prevalent river in which we’re currently being carried by is entering a period of increasing turbulence, and that a new river can be formed through the disciplined repetition of thoughts and actions, then the most effective strategy to move us towards safety is to actively forge this new path through altered habits. These habits are encompassed by what we all choose to eat, how we transport ourselves, how we draw our energy, and even by what knowledge/information we seek, who we spend time with, and how we treat others. Once this river of new and improved habits is deeper and stronger, it becomes much easier to divert the current flow into the new one. So my take home message would be this: set up your own personal challenge(s). Set aside half an hour a day to educate yourself on the state of the world, volunteer within your community, go offline from your computer, develop a yoga, meditation or mindfulness practice, try eating vegetarian, raw or local diets, calculate your ecological footprint and commit to reducing it 10% each year, try living a while without alcohol/sugar/coffee/plastic/waste… turn some of your positive intentions into actions, and then make them into habits! It is incredibly empowering! I guarantee there is something that has been nagging in the back of your head for a while now, urging you to act on it with more conviction. Do it, and do it sooner than later… when we act, we give others around us permission to do the same and that’s how change takes hold… we all touch and impact many more people than we often realize. The level and depth of change that we seek to bring about in the world is directly related to the scale of change we are willing to undergo ourselves. That pretty much says it all, eh? This is great. The diagram is a excellent representation of integral quadrants as well, did you make it? Yes, this has been on my thoughts the past couple of years. And I think one of the reasons why our Masters in Sweden was so effective is at the people joining the class have a strong sense of discipline to undertake a masters in a year, whilst developing a myriad of other skills and other interests. Similarly, and this could be a step too far, but there is also a sense of discipline in Scandinavian countries, and lack of greed, and thus in these countries, ideas of less is more, and a basic systems understanding ‘seems’ to be endemic in their culture. Vast generalisation there, but I think there could be something in it, compared say to the ethos of the States and Britain. Hey Petro, thanks for your thoughts! Interesting reflection about Scandinavia… I don’t know if it’s so much conscious discipline on individual levels as much as it is responsible policy development. If everyone recycles, for example, it wouldn’t take discipline to start recycling (like it would in places that don’t have programs in place). So perhaps the discipline can be seen as taken more by those in the public or policy realms who understand the societal benefits of certain programs/issues and stand their ground in pushing them through (thus resisting special interests that tend to decay governance in the US and Britain). Interesting thought, and it almost touches on the third level in the visual above, cultures/collective action. And I would like to add that I feel discipline is helping and necessary to focus on what you want to achieve. It easy to go for quick rewards and get lost in information overload every day. So, yes individual scale of change can make a big difference and is something everyone can do (circle of control). Question pondering…How to trigger the individual thought? Hey Seb, thanks for your thoughts and GREAT link you shared… very helpful resource to further bring these ideas to life.